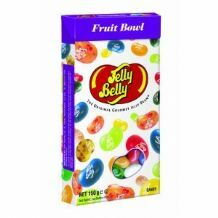 Jelly Belly Assorted Mix Pyramid Bag 10g. Flavours may include: Liquorice, Blueberry, Tutti-Fruitti, Lemon, Orange Sherbet, Very Cherry, Green Apple, Coconut, Watermelon, Tangerine, Strawberry Daiquiri, Buttered Popcorn, Island Punch, Peach, Toasted Marshmallow, Lemon Lime, Candy Floss, Bubble Gum, Pina Colada. gredients: sugar, glucose syrup, modified corn starch, peach puree concentrate, strawberry puree, acidity regulators: E325, E330, E331; natural and artificial flavours, blueberry puree, coconut, colours: E100, E102, E110, E129, E132, E133, E150d, E171; chocolate: sugar, chocolate liquor, cocoa butter, soy lecithin, vanillin; glazing agents: E901, E904; lemon puree, tangerine juice concentrate, cocoa powder, ascorbic acid, salt, tapioca dextrin. suitable for vegetarians. kosher. gluten free, fat free, geltine free. manufactured in a factory that processes nuts.